This entry was posted in Uncategorized on July 28, 2014 by Georgina Campbell. 2014 Josephine Ulrick and Win Schubert Photography Award. This entry was posted in Uncategorized on February 27, 2014 by Georgina Campbell. I have a work selected for the Alice Prize this year! Cleared Snow on Hrisey, Iceland, 2013. I have been selected as a finalist in the Walker Street Gallery’s She Exhibition for 2014 with my work “The Spectacle”. edition of 10, xerographic print. AUD$300. Experienced and emerging female artists are invited to submit work for Walker Street Gallery’s She exhibition in March 2014. Works can be two or three dimensional and created in any medium. Finalists of She will be exhibited at the Walker Street Gallery and Arts Centre from 8-29 March 2014. This entry was posted in Uncategorized on February 14, 2014 by Georgina Campbell. 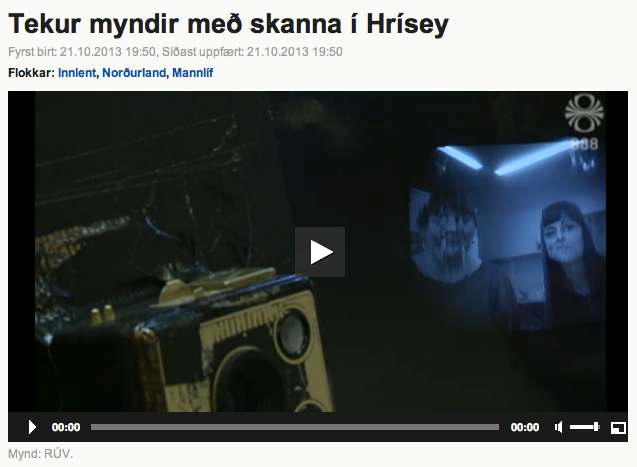 Recently, I was interivewed for Ríkisútvarpið RUV – The Icelandic National Broadcasting Service here at Gamli Skoli artist residency on Hrisey, Iceland. Here is a link to the segment. Its only about 2 minutes long and features me talking about my scanner camera and what i am trying to do with it. It was a bit of a surprise – was not expecting any visitors and then a camera crew turns up on a tractor! This entry was posted in Uncategorized on October 24, 2013 by Georgina Campbell. Another work curated by Saatchi Online. Click through to see whole collection. This entry was posted in Uncategorized on October 14, 2013 by Georgina Campbell. My image, Untitled Book Experiment No.3, has been included in a collection on Saatchi Online. This entry was posted in Uncategorized on May 29, 2013 by Georgina Campbell.